The ProgRes STAR is the latest model in the successful ProgRes series by JENOPTIK Laser, Optik, Systeme GmbH. 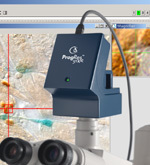 An easy to use camera for professional and productive scientific imaging. This camera is the one that gets the "ultimate bit" from the 3 Megapixel SONY CCD used also in many other microscope cameras. Powerful image processing and display software provides you control over the full dynamic range of your camera: 4096 levels (12bits) per RGB channel. Why should you be content with the 255 levels (8bit) other cameras provide? 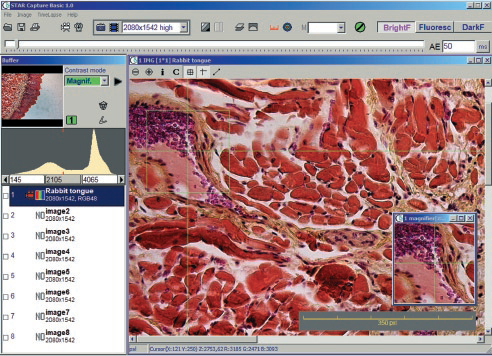 Among the included automated functions the modular control software provides you will find time lapse imaging live shading correction and more. A 3 million square pixel SONY Super HAD CCD sensor delivers highly detailed and sharp colour images. Supports exposure times from 0.2ms up to 180s. Free from wear: no mechanical components. Direct digitization in the camera head significantly minimizes noise compared to framegrabber boards. 4096 distinct shades per color channel result in crisp images revealing even the subtlest detail.. The camera control software handles the full color depth of 12 bit per RGB channel and visualizes it on any standard color monitor. For mastering high contrast images. An industrial standard interface provides a fast and easy connection to your computer by one single cable. Fits the camera to all microscopes (0.5x TV adapter recommended to adapt field of view) or C-Mount lenses. Mounts the ProgRes STAR also on repro-stands. ProgRes STAR Capture Basic camera control software with 16bit image processing, adaptive contrast display, live shading and background subtraction, time lapse imaging, micrometer scale and more automated functions. Ask your personal supplier for a demonstration. 24 months warranty.Support by specialist dealer, telephone, internet and mail.